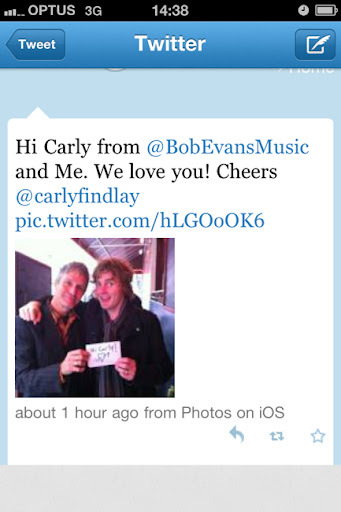 Tune into Radio Carly: Bob Evans - he just don't wanna grow up anymore. The interview. Bob Evans - he just don't wanna grow up anymore. The interview. When I turned down a phone interview with Kevin Mitchell aka Bob Evans due to a meeting for my day job, I asked my manager to mark that day in her calendar and remember my high commitment and prioritisation to my day job. That interview would have been a pinnacle in my writing career. I was almost William Miller in Almost Famous. I was almost Paul Cashmere. Only less knowledgable about music and a bit too much of a fangirl to be a proper music journo. 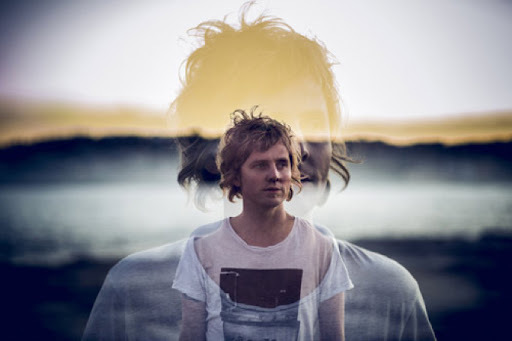 I've been a fan of Perth-turned-Melbourne singer songwriter Bob Evans' music for around six years. And then I became a Jebediah fan. Here we are after his show at The Tote. 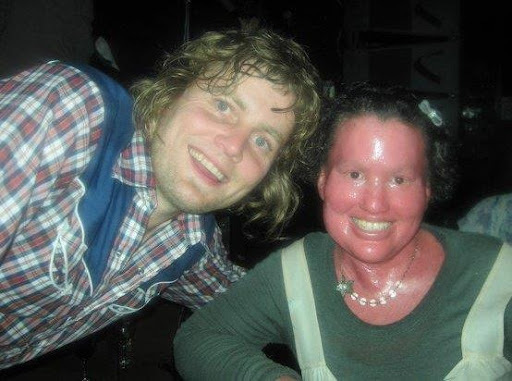 He's frontman of Jebediah, one quarter of the supergroup Basement Birds and has been a regular on the RockWiz live tour. I once awkwardly got on stage with him to hold his lyrics! A word of advice: don't wear skinny jeans to a concert just in case you need to climb up on the stage. 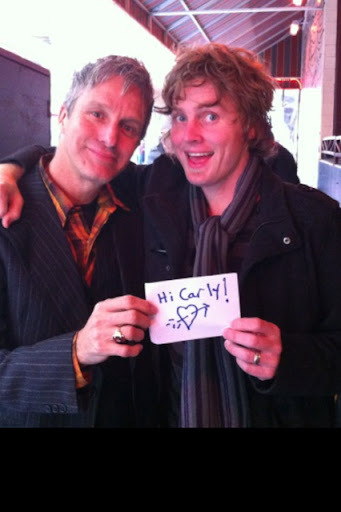 He and Steve Poltz also sent me a tweet with this message. 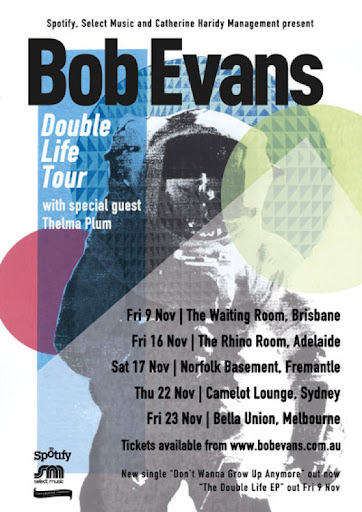 I am so happy Bob Evans has got an upcoming EP, Double Life, out 9 November, and an upcoming Australian tour, commencing on the same day - see tour dates below. He told me about his latest song, Don't wanna grow up anymore, in an email interview. "Don't Wanna Grow Up Anymore is pretty self explanatory. The older you get the more responsibilities there are and sometimes it seems like things were easier or better in the past. Everyone is prone to a little nostalgia. For me it's my late teens and early twenties. The weird thing is, I'm much happier now than I was then. That time of my life was full of insecurity and angst. So I suppose there is a tendency to put on rose coloured glasses when we look at the past." Still y'know, I just don't wanna grow up anymore..."
"My Dad. I had to think long and hard about this! There actually isn't that much I miss to be honest. The best things about being a kid you take for granted at the time anyway, like the endless potential and possibilities you have. You're not aware of those things. So the only thing I really miss about my childhood is my Dad, cos he died soon after my 20th birthday and he was a really good guy." In the past year, Kevin's become a dad to a beautiful baby girl. I wondered what he'll be passing on from his childhood to hers. "There are definitely values that I was brought up with that I will try and pass on to her, like being polite and well mannered and showing people respect. I read to her everyday and I will keep doing so for as long as I can because books were important to me when I was younger and I think kids that read do better at school. I also spent a lot of time outside playing and hopefully I can encourage her to do a bit of that too although I know these days it seems to be dying out a bit." Kevin's been around the music scene for a while now, more than half his life. He's been playing in Jebediah since the mid 1990s - they were a band that I was pretty scared of, during my Savage Garden days - which I told him a couple of years ago. I asked him if being a rockstar has helped helped keep his youth. "I'm not sure. I've never felt like a rock star but I'm sure that my occupation has helped keep me young at heart, cos I love it and I love the life it's given me. I definately think there is a link between happiness and holding on to your youth." I have always enjoyed the visually creative videos and artwork Kevin pairs with his music. Leading up to the release of Don't wanna grow up anymore, teasers of lyrics were alongside nostalgic photos from the 1980s. I thought they were a real treat. I asked Kevin whether he enjoys the visual side of the creative process as much as making music? "Ha! Not really to be honest. I don't really enjoy any activity as much as making music! I've never really considered myself very good at the visual side of art. I appreciate it as an observer but I'm terrible at coming up with it myself. When I write music I can usually satisfy myself with the end result being close to what my imagination was calling for. With visual stuff that doesn't really happen so much! But I'm glad you enjoyed it!" Thanks to Kevin Mitchell/Bob Evans for your words, and to Kirsten at Bob Evans HQ for organising!